Network chronicles the career of "the most trusted man in America"
Walter Cronkite, the CBS newsman so revered by Americans that they considered him the "most trusted man in America," died today. He was 92 and had homes in New York and Martha's Vineyard, Mass. 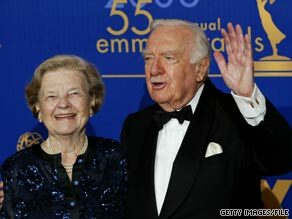 Walter Cronkite with wife Betsy in 2003. They were married from 1940 until her death in 2005. Cronkite was the biggest name in television news, the king of the anchormen; in fact, he was the reporter for whom the term "anchorman" was coined. He gave up that role 28 years ago, but never lost the weight and respect it accorded him, living the rest of his life as the industry's distinguished elder statesman. As anchor and managing editor of the "CBS Evening News" from 1962 to 1981, Cronkite became the symbol of CBS News and the face two generations of Americans associate with some of the biggest stories of the 20th century. Speaking in a calm, authoritative voice with a screen presence that exuded confidence and familiarity, Cronkite formed a bond with Americans by bringing stories such as the assassination of President John F. Kennedy, space launches and the Vietnam War into their living rooms. The bond was so strong that Americans polled in 1973 chose him -- by a 16 percent margin over the nearest competitor -- as the "most trusted" public figure in the country. He still enjoyed that status 22 years later, according to a poll published in TV Guide in 1995, nearly 15 years after relinquishing his anchor chair. No doubt aware of the power that came with such respect, Cronkite never exploited it. Though it was suggested many times that he run for public office, he knew it would be devastating to journalism if reporters decided to capitalize politically on their popularity. Cronkite's popularity was growing for 10 years before he took over the 15-minute "CBS Evening News" from longtime anchor Douglas Edwards on April 16, 1962. The next year, on Sept. 2, 1963, Cronkite's news became the first half-hour network weeknight news broadcast. In an effort to punctuate the longer broadcast and personalize it in the process that first night, Cronkite conceived and delivered for the first time his iconic sign-off, "And that's the way it is." It didn't happen overnight, but the "CBS Evening News With Walter Cronkite" eventually overcame NBC's "Huntley-Brinkley Report" in the ratings and became the television news broadcast of record. Cronkite became one of the first nationally recognized television reporters and the model for the electronic news term "anchorman" when he reported from the 1952 Republican Convention in Chicago. There, executives decided he would assume the crucial role on the team reporting the event, a role likened to the anchor spot on a track relay team. Cronkite remained the CBS News "anchor" for conventions and elections until 1980. If the Kennedy assassination was the birth of modern television news, then Cronkite was midwife at an event that drew an entire nation to the still-novel medium. It was Cronkite, removing his glasses to wipe a tear, who first reported the president's death on television and the man the country watched for much of the four commercial-free days that CBS News remained on the air -- coverage some credit with helping to hold together an anxious nation in the midst of the Cold War. No other network covered the space program as thoroughly as CBS News, and Cronkite, openly enthusiastic over its advances, became inextricably linked to it and is often credited with being the program's biggest booster. "Old Iron Pants," as Cronkite was known for being unflappable on live television, stayed on the air all but three of 27 hours of the Apollo 11 lunar walk coverage. He admitted late in his life that he was so awed when Neil Armstrong landed on the moon that, for once, he was at a loss for words and merely uttered "Whew. Oh boy." Another story Cronkite seemed to make a personal mark on was Vietnam, also a baptism for television news. Despite the graphic images of death and destruction typical in America's first televised war, he, like most Americans, seemed to support the conflict. After the bloody Tet Offensive of 1968 signaled a longer war, Cronkite decided to see for himself. He returned from Vietnam believing the war to be a quagmire and, in a rare editorial moment during a CBS News Special Report on Tet, told Americans as much. President Lyndon Johnson, watching the broadcast, is said to have told his press secretary that if he had lost Cronkite he had lost the American public. Indeed, public opinion for the war, already shifting, plummeted. Cronkite's decision to cover the Watergate story also influenced the public and created a problem for a president. Heeding the drumbeat of coverage in the New York Times, Washington Post and the Los Angeles Times, Cronkite told the whole story in a two-part investigation on "The CBS Evening News." Cronkite's Emmy-winning report was the first to put all the facts in the story together in one place and elevated the controversy to a new level of awareness, drawing an angry call from the Nixon White House to CBS Chairman William Paley. Another example of Cronkite's reporting having influence on news events was when he interviewed Egyptian President Anwar el-Sadat in 1977 and asked him if he would be willing to visit Israel. The two countries were still technically at war and the interview led to a peace treaty. Walter Leland Cronkite, Jr. was born in St. Joseph, Mo., on Nov. 4, 1916, to Walter Leland Cronkite, a dentist, and the former Helen Lena Fritsche. He became fascinated with journalism in high school, writing for his high school paper and getting a summer job with the The Houston Post, a paper he wrote for and occasionally delivered, too. He then attended the University of Texas at Austin for two years while juggling writing jobs for the Houston Press and Scripps-Howard as a state Capitol reporter. He dropped out after two years to pursue his journalism and broadcasting interests that also included working as a sports announcer for a radio station in Oklahoma City before joining the United Press in 1937. In 1940, he married Mary Elizabeth Maxwell, whom he met at KCMO radio in Kansas City, Mo. He and "Betsy" had three children: Nancy, Kathy and Walter (Chip), who survive him, along with four grandsons. Mrs. Cronkite died in March of 2005. Cronkite became a war correspondent for United Press when World War II broke out, landing with the invading Allied troops in North Africa, covering the battle of the North Atlantic in 1942 and taking part in the Normandy beachhead assaults. He landed in Holland by glider with the 101st Airborne Division in 1944 and later was with Gen. Patton's Third Army covering the Battle of the Bulge. He was one of the first newsmen to fly on B?17 raids over Germany launched from England. While in London, he met legendary CBS newsman Edward R. Murrow, who offered him a job as a radio correspondent. Cronkite turned down the opportunity to be one of "Murrow's Boys" when his boss at United Press countered Murrow's offer with a modest raise he felt obliged to take. He went on to cover the German surrender, the Nuremberg trials and reopen several bureaus in Europe before becoming chief correspondent for United Press in Moscow. The next time Murrow offered, Cronkite jumped at the chance to cover the Korean War for CBS News and joined its Washington bureau in 1950. He never got to Korea, however, as a temporary role anchoring the news for the CBS local television station, WTOP, showed off talents CBS News brass thought would be better employed as a Washington correspondent. This led to news division head Sig Mickelson picking Cronkite to lead convention and election coverage -- the start of the central role he would play in CBS News for the next 30 years. In 1954, the up-and-coming Cronkite was asked to move to New York to be host of CBS's "The Morning Show," to answer NBC's "Today Show" success. Some felt he looked awkward in the role and he was soon replaced by Jack Paar. Cronkite then found a more comfortable niche in other programs, serving as narrator and host of such early CBS News staples as "You Are There," "Eyewitness to History" and "The 20th Century." He also anchored and reported for documentaries under the "CBS Reports" banner -- a role he continued throughout his career. To much fanfare, Cronkite stepped down from his anchor duties on March 6, 1981 to allow Dan Rather to take his place. He became a special correspondent and hosted several acclaimed CBS documentary programs, including the Emmy?Award winning "Children of Apartheid" and the CBS News science magazine series "Walter Cronkite's Universe." He also appeared on PBS, most notably as host of the New Year's Eve Vienna Philharmonic Concert, and was a special correspondent for CNN and NPR. In 1993 he co?founded The Cronkite Ward Co., which has produced more than 40 award?winning documentary hours for The Discovery Channel, PBS and other networks. In 1985, Cronkite was inducted into the Academy of Television Arts and Sciences Hall of Fame. He won four Peabody awards for excellence in broadcasting over his career and won virtually every electronic journalism award in existence during his tenure, including the du Pont Columbia, George Polk and Emmy awards. Cronkite twice won the Radio & Television News Directors' Association's highest honor, the Paul White award, a distinction shared by only one other, the late Dr. Frank Stanton, former CBS president. In 1981 Walter Cronkite was awarded the Presidential Medal of Freedom -- the highest honor a U.S. civilian can receive. Cronkite donated his personal papers to the University of Texas at Austin. He allowed his name to be put on an endowment for Arizona State University's journalism school, now called the Walter Cronkite School of Journalism and Mass Communication, and on the University of Southern California's Annenberg Award for excellence in television political journalism. Cronkite Ward Co., in collaboration with CBS and The Discovery Channel, produced his video memoirs entitled "Cronkite Remembers." A two?hour special was aired in May 1996, and a longer version, an eight?hour series, appeared on The Discovery Channel. CBS News feted Cronkite in 2000 on his 50th anniversary with the Network. Industry luminaries joined Cronkite at the Freedom Forum in New York to recollect 50 moments from his incredible career, each picked by Cronkite himself. His distinctive voice could still be heard on television up until his death, introducing "CBS Evening News With Katie Couric" and on AARP's Retirement Living Television. Cronkite was an adventurer. Before taking up long-distance sailing as he became older, he competed as an amateur racecar driver, racing with the Lotus team at Limerock, Conn., and the Lancia team at Sebring, Fla., in the late 1950s. Later, Cronkite recorded his experiences sailing from the Chesapeake Bay to Key West in his book "South by Southeast" (Oxmoor House, 1983), covered the Northeast coast in "North by Northeast" (Oxmoor House, 1986) and recounted his sailing tour of America's West Coast in "Westwind" (Oxmoor House, 1990). Cronkite's first book, "Eye on the World" (Cowles, 1971), is an edited compendium of CBS News' reporting on the major trends and stories of 1970, for which he provided analysis and commentary. Another, "A Reporter's Life" (Knopf), was a best-seller in 1996. His last book, "Around America," a reprinting of his three prior sailing adventures on America's coastlines, was published by Norton in 2001. He was active in several charities, including: Citizens for Global Solutions, Committee to Protect Journalists, Common Cause, Drug Policy Alliance, Interfaith Alliance, Heifer Project, and People for the American Way. Cronkite was named Honorary National Commodore in 1977 by the U.S. Coast Guard Auxiliary.